... not just emotionally and the cost of legal help - but in the months and years after when couples have to look after children from two separate homes and the available income has to stretch hard. 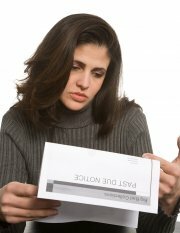 The divorced are one of the most vulnerable groups when it comes to going broke. I got into debt myself using credit cards the banks had foisted – often unasked for – onto me and, following divorce and illness, was horrified at the mess my finances were in - with compound interest and charges stacking up nicely for the banks. But when banks' debt collectors started bullying me and I realised I'd always be their victim unless I something about it, I decided to tackle the banks head on and sort it. You can read about what I did – and others might wish to do – in my new book: HOW I GOT OUT OF DEBT BY PLAYING THE BANKS AT THEIR OWN GAME - and paid just £2,300 when they were demanding £53,000 – by Linda Franklin. The title says a lot but when I found I'd racked up this alleged £53k worth of debt but had no means to repay I went to the CAB and a debt counselling charity and did what they suggest as standard, paying 'surplus' income pro rata to the banks every month. But if I had surplus income I wouldn't have gone into debt in the first place and it would go on until I was 143 – and they still hassled me relentlessly. Trawling the net, I found there were many ways of fighting back legally if the banks had been slipshod in their business dealings with me (they so often had) – also that they're usually happy to finish up a debt with a low final payment. You just have to let them know you're not an easy target who just rolls over and acts the victim. I decided I'd had enough of the banks' game - where they and their debt collection agencies bully and harass their debtors mercilessly - and turned the tables on them, insisting my proper legal rights be adhered to. In the end I paid a fraction of what they alleged was due and – although I invite them to sue me – they never do; perhaps because they might have to pay compensation for what I'd allege is harassment (in fact I got a cheque just last week from one bank as compensation for harassment). My book shows how I tackled them. And others can do it too. The book looks at how people get into debt - and how it piles up - in order to 'de-shame' it, points to good organisations and websites that can help depending on your situation at the time, it highlights practical matters to attend to before anyone starts tackling the banks. I received a lot of help from great websites and organisations, but realised there isn't one place where it's all pulled together, without having to follow other people's 'threads', and usually only short, standard letter templates are offered that Debt Collection Agencies (DCAs) often ignore. I realised what people want when they're down on their luck, in money trouble and being harassed by DCAs doing the banks' dirty work is some oversight and reassurance from someone non-judgmental who's been through it themselves – and so who knows how it all actually works in practice. I also realised there's little help available generally about the situation with overdrafts, so I share the invaluable information that helped me. The book shows how I got funds together then how I approached full and final offers; it shows how I checked if credit agreements are enforceable and shows the implications if they're not; it looks at Unfair Relationships and what might constitute one and how the onus is on the bank – not the customer - to show there isn't one; it shows what I did about disputed overdrafts; how I got the dreaded DCAs on the run, and how I'd allege some banks seem to use the (industry funded) Ombudsman as part of their game. There are also some much weightier letter templates than most others offer quoting relevant parliamentary acts, fair trading guidelines and court judgements that mean the debt collection agencies have to take note or face possible proceedings themselves. These are substantial letters which change the balance of power and I've found they stop dead the bad behaviour. I transformed the situation from one where I felt ashamed and harassed while they bullied me to one where I was in control and they eventually backed off. The book is available on Amazon Kindle at £3.44p and Linda's website at £4.99.